Pat dry the duck breasts with a paper towel. Score the duck skin with sharp knife, making sure to not cut into fresh. Season the duck breasts on both sides with salt and pepper.... Score the skin in a diamond pattern (or just make a few slits, the shape really isn't important) & make sure not to cut through the meat. Start the breasts in a cold pan, skin down, then put the burner on medium to let the fat render. Preheat the oven to 400?F(200?C). Pat dry the duck breasts with a paper towel. 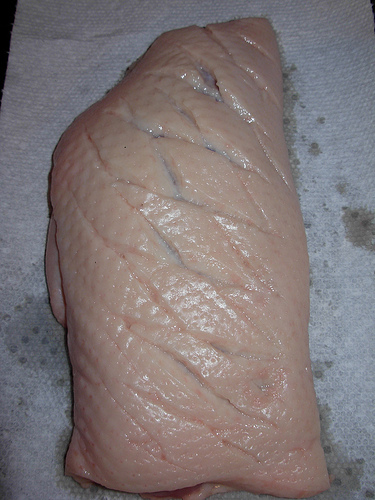 Score the duck skin with sharp knife, making sure to not cut into fresh.... Pat dry the duck breasts with a paper towel. Score the duck skin with sharp knife, making sure to not cut into fresh. Season the duck breasts on both sides with salt and pepper. Cook duck breasts in pan over low heat until pink. Season with salt and pepper and rest in a warm place. Season with salt and pepper and rest in a warm place. To make the panna cotta, boil the cream, add the whisked eggs and celeriac puree and season with salt and pepper. Heat a dry heavy-based large frying pan to medium and lay the duck breasts, skin side down. Fry for about 8 minutes, until most of the fat has rendered and the skin is golden brown. Turn the duck breasts over and lightly brown the other side for about 3 minutes. For this postcard I wanted to share the method for cooking the duck breasts to get that perfect crispy skin and juicy tender pink meat with tasty salads to accompany it that pay homage to the local dish of cassoulet and the classic Duck a l�Orange.